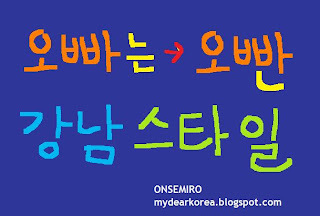 MY DEAR KOREA: KOREAN LANGUAGE: What is Oppan (Oppa) in Gangnam Style? KOREAN LANGUAGE: What is Oppan (Oppa) in Gangnam Style? "Oppan Gangnam style," the hook of the song "Gangnam Style," can literally translate to "I'm Gangnam style," in which "oppa" is a Korean referring expression used by females to call older males such as older male friends or older brothers. However, the narrator in the song refers to himself in the third person. It's annoying and creepy most of the time, right? But in this song, it was intentionally used to make him look ridiculous. "Oppan" is not a single word but a noun phrase, a shortened form of "oppa + neun." Unlike English which has a relatively fixed SVO (subject-verb-object) word order, Korean has a relatively free SOV word order in which the subject and the object can also be freely omitted. So, "loosely" speaking for the sake of quick and easy explanation, Koreans use case markers (or particles) to tell which noun is a subject and which noun is an object. The subject marker "-이"(-i) is used after a noun that ends with a consonant (e.g., hyung-i) and "-가" (-ka) is used after a noun that ends with a vowel (e.g., oppa-ka); the object marker "-을"(-eul) is used after a noun that ends with a consonant (e.g., hyung-eul) and "-를" (-reul) is used after a noun that ends with a vowel (e.g., oppa-reul). Korean also has two types of topic markers: "-은"(-eun) comes after a noun that ends with a consonant (e.g., hyung-eun) and "-는"(-neun) comes after a noun that ends with a vowel (e.g., oppa-neun). Korean topic markers are basically used (i) to specify the topic of a sentence or (ii) to deliver a contrastive meaning. "Speaking of oppa (=me), I am Gangnam style." "I don't eat other fruit, but I eat apples." Thus, in this song, "oppan" (오빤) is a shortened form of the noun phrase "oppa-neun" (오빠는) and the hook "Oppan Gangnam style" translates to "Speaking of oppa (=me), I like Gangnam style life." And the hook in Hyun-a's version of the song, "Oppan ddak nae style," translates to "Speaking of oppa (=you), you're exactly my type (of guy)"; and the rest of the lyrics is pretty much the same as in PSY's original version. Thanks for that excellent explanation! Anonym @1:02 AM, you're welcome! Many thanks for the explanation. Cheers. Interesting and valuable information about the oppa app it's really very amazing. REPORT VIDEO ERRORS: If any of the videos uploaded here is no longer available, please report it in the comment so that it can be fixed or replaced. This blog is optimized for Google Chrome. ::: 이 블로그는 구글크롬에 최적화 되었습니다. KOREAN CULTURE: Saehae Bok Mani Badeuseyo! KOREAN SHOWS: Deulgukhwa (Wild Chrysanthemum) Covered on NAGASU, "I Am a Singer"
If any of the videos on this blog is no longer available, please report it so that it can be fixed or replaced. 2011, 2012, 2013, 2014 All rights reserved. 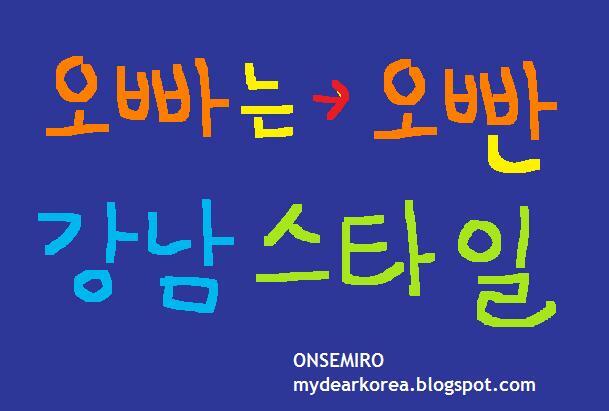 ONSEMIRO@My Dear Korea @mydearkorea.blogspot.com. Theme images by Jason Morrow. Powered by Blogger.